> Adobe > Data-driven Marketing is the Answer. Now, What’s the Question? More and more, ‘customer-first’ is becoming a staple of mission statements and a guiding principle for marketing, sales, and support organisations across every industry. Meanwhile, the product, operations, and finance functions have long been anchored in analytical decision-making processes and frameworks. 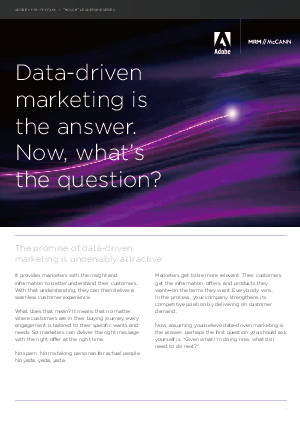 Download this paper now to find out the benefits of using data-driven marketing.